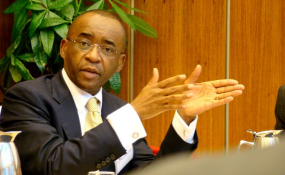 Econet Wireless founder, Strive Masiyiwa. "As it was a written directive issued in terms of the law, non-compliance would result in immediate imprisonment of management on the ground." The order was issued by State Security Minister Owen Ncube in terms of The Interception of Communications Act which exiled former information minister Prof Jonathan Moyo immediately described as unconstitutional. Masiyiwa suggested that the opposition could have pushed for repeal the statute when it was part of the unity government between 2008 and 2013. "It (law) came into effect in August 2007. It could easily have been repealed during the GNU as the opposition had majority legislators," said the London-based billionaire tycoon. According to a Twitter post by Prof Moyo, four of Zimbabwe's international gateways are controlled by the government through quasi-State companies while the fist is run by Econet. However, Masiyiwa said his company could not be blamed for the internet blockade as it had no choice but to comply with the law. "I'm sure you will agree that it is extremely unfair to blame Econet executives and engineers in Zimbabwe for something over which they have no control, and which threatens them with imprisonment should they resist," he said. Minister Ncube's order blocked access popular social media platforms such as Facebook, Twitter and the mobile text messaging application WhatsApp, leaving activists unable to share updates on the situation in the country. There was no official confirmation or explanation from the government until Masiyiwa released a statement from his company showing that the order was issued by the State Security Minister. Reds the Econet statement; "Further to a written warrant issued by the Minister of State in the Office of the President and Cabinet, through the Director General Of The President's Dept. responsible for National Security, acting in terms of Section 6, of the Interception of Communications Act, Internet Services and related applications such as WhatsApp, Twitter etc., are currently suspended across all telecommunications networks, and Internet Service Providers. "As an organization we are obliged to act when directed to do so in terms of the law. All inconvenience caused as a result of this action is sincerely regretted. We urge others to respect that this is a matter beyond our control." "(2) A service provider who fails to give assistance in terms of this section shall be guilty of an offence and liable to a fine not exceeding level twelve or to imprisonment for a period not exceeding three years or to both such fine and such imprisonment." Opposition groups and activists warned that the internet suspension was aimed at stopping publicity of a security services crackdown against civilians which started late Monday night after the deadly unrest in Harare and Bulawayo. The blockade also drew strong condemnation from activists and political parties across the border in South Africa.